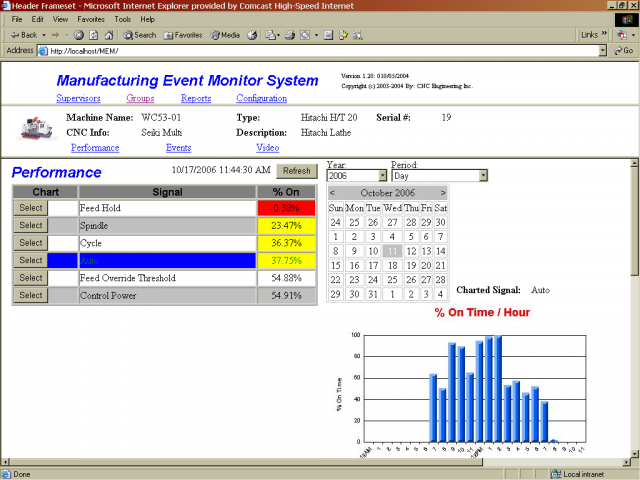 OVERVIEW Manufacturing Event Monitoring (MEM) is a term used to describe the collection of status information to support equipment availability. Event monitoring can range from the simple to the complex. For some it represents a record of NC program downloads in order to make assumptions regarding job schedules. Others, armed with a complete record of machine status, will prefer to analyze the relationship of all machine events, and the capability of precisely gauging machine availability, potential, and in-cycle utilization as well as overall equipment effectiveness (OEE). In general, people think in terms of reducing cycle time to achieve increased throughput and higher production. Event monitoring builds on this process and then takes it one step further. It aids in identifying time-consuming processes that ultimately detract from the overall available cycle time. SELECTION OF EVENTS When event monitoring moves beyond that of simply tracking file transfers, it becomes necessary to accurately record specific events. Some examples include; Power On, Cycle Start and Cycle Stop, Spindle ON/OFF, Feed Hold, Feed Rate Override, Delay and Repair Time, and if necessary, operator events like breaks, lunch, in-process inspections and meetings. The key is to monitor all events relevant to your goals. For example, recording in-cycle time will provide a picture of in-cycle utilization. However, seen alone it lacks depth until it is shown as a percentage of Feed Hold, Feed Rate Override, Delay and Repair Time and more especially Out-of-Cycle Process Time. If statistical data provides insight to gain a ten percent increase in overall in-cycle time, and if the increase is multiplied by ten machines, the gain is equivalent to adding an additional machine and operator without the associated costs. It now becomes clear that event monitoring is a tool to increase production through a process of lower production costs (increased efficiency), which will pay greater dividends than simply investing in additional capital equipment and manpower. FEARS AND PITFALLS As with any comprehensive project, the introduction of MEM is likely to stir apprehension among machine operators. Its name conjures visions that operator/machine events are being watched. These fears, though normal, are quickly allayed when everyone understands that it is the process and not the person that is being studied. For this reason it is important that everyone understands the goals and objectives and that operator feedback plays a large role when individual cycle times are being reduced. EQUIPMENT CONSIDERATIONS Another important consideration is the need to invest in readily available equipment. Since event monitoring is an automated process, it should be understood that the collection device(s) determine software designs. With that in mind it is far better to have a system designed with readily available commercial devices than to discover down the road that the system must be retired due to obsolete proprietary components. Furthermore, a system designed around readily available components is easier to maintain and upgrade. AVAILABLE CONFIGURATION OPTIONS CNC Innovations currently uses two configurations to gather machine status information. Both methods use terminal type I/O modules, which communicate machine status information via a 10Base-T Ethernet connection to an SQL server. Direct I/O to Ethernet This method provides a simple and direct link to the server database. Machine status is continually monitored without operator intervention. Machines connect to a local area network via Category 5 cabling and network hubs or switches. Direct I/O to PC to Ethernet This method provides the same connectivity but allows the added benefit of a machine based PC. A PC based configuration gives operators instant access to shop documents, which may include part drawings, NC Programs with optional DNC ability, setup and historic information, as well as photos and inspection documents. Providing instant access to such information translates to a measurable decrease in Delay and Out of Cycle time. DATA ANALYSIS Just as important to gathering event information is the ability to review the data in a meaningful way. MEM provides a number of standard reports designed to display individual or multiple machines, grouped by cell or by supervisor name, and filtered for a given segment of time. The results are displayed in both graphic and numeric format with percentage calculations and color-coded warning indicators. Furthermore, to support the varied needs of customers, CNC Innovations can create custom reports. SUMMARY The ability to monitor and record machine events, coupled with powerful analytical tools, provides valuable feedback for improving shop efficiency. Improved efficiency translates to lower costs and increased production capability. Are there any Fanuc i Series?